No offense to Mr Whippy, but sometimes our taste buds deserve a slightly more adventurous summer tickle. With more and more people on the lookout for dairy alternatives, less calories or something truly instagrammable, here are our suggestions for tasty delights that are slightly more ‘out there’. Lactose intolerance is on the rise in young people and would usually have meant a life without ice cream. Sorbets are vegan anyway and there’s plenty available in London, but the proper creamy stuff is hard to achieve without dairy. Step forward the Greedy Goat ice cream parlour at Borough Market! Goat’s milk is naturally suitable for those with a lactose intolerance and is also lower in fat and calories than traditional cow’s milk ice cream. You might think it's going to taste sour or "goaty" but actually it tastes less fatty and enhances the flavours. The range is a delight for anyone wishing to enjoy a healthy treat, with some exciting options such as Matcha Tea over Clotted Cream, Olive Oil and Pistachio or Strawberry Balsamic. Jude’s is still, as far as we are aware, the only London provider of black ice cream, that instafamous craze from L.A. Whilst the black colour comes from activated charcoal, the flavour is actually coconut, which we have been told is pretty mild. It won’t taste of burned barbecue in any case! Jude’s is a family business, started in 2002 by one man and his sons who made ice cream named after their mum Jude. They have since been raking in over 40 Great Taste Awards for their flavours. It’s available in pots at Whole Foods and Waitrose and various cinemas but if you need a scoop in a cone for that Insta-feed you will need to get out to the Pear Tree Café in Battersea. French macarons are delightful but just imagine macarons filled with ice cream! This is what Chef Sammie Le, queen of the ice cream macaroon sandwich, has come up with. A passionate macaron fanatic, she was looking for a good way to use up the millions of egg yolks she had left over, as macaron meringues only need egg whites. Egg-yolk ice cream is a creamy, buttery old-school style of ice cream making and that goodness stuffed into a macaron has our cold hearts melting. Yolkin just opened their first permanent store in Chinatown this April, so get yourself down there and try some of the exotic flavours from Lychee and Black Sesame to Earl Grey or vegan Pandan and Coconut. Yolkin is at 24 Rupert Street, Soho. This former condom shop in Camden is making ice cream with liquid nitrogen, which is apparently the future of ice cream. Liquid nitrogen, which has a boiling point of -196C is used in restaurants as a method for instantly freezing food and drinks. Made famous by molecular chef Heston Blumenthal, this avant-garde cooking technique creates an impressive cloud of vapour or fog at the table. The rapid freezing produces an ice cream with particularly small ice crystals, resulting in a very smooth texture. It sounds like an adventure, especially when you sprinkle your Tonka Bean or Pineapple & Habanero Chilli flavoured ice cream with exotic toppings such as bee pollen or cardamom powder. Chin Chin Labs is at 49-50 Camden Lock, Camden and 54 Greek Street, Soho. 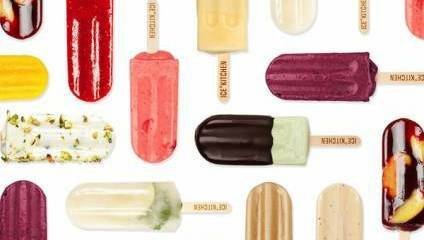 Ice lollies or popsicles are having a moment right now, not for nostalgic sticky fingered children but in a gourmet version for health conscious adults. Non-dairy, gluten free, 100% natural ice popsicles have way less calories than ice cream and all the vitamins and antioxidants of the fruit you put in. Ice kitchen started out in New York in 2010 and has since ventured to London. They come up with new and exciting flavours every season such as Peach and Hibiscus from the 2018 range (with two full slices of peach floating in the lolly) or loose leaf Earl Grey Tea scented with the oil of bergamot orange, which has barely 182 calories. It is notoriously difficult to get alcohol into ice cream (because of its lower freezing temperature) but with lollies and granitas it works, resulting in a whole range of Poptails from Mojito to Cosmopolitan to Bourbon and Coffee Cream. If you want to get creative yourself the book 'Ice Kitchen: 50 Lolly Recipes' offers plenty of inspiration so you can make them as healthy – or boozy – as you like. Ice Kitchen popsicles are available at Real Food Market on the Southbank and at various cafes, delis, restaurants and pop-ups across the UK.